In Part 2 of this 2 part tutorial, Get to know the Brush Variance Palette. Create a Tool Preset using the Brush Variances. One of the coolest new features in PSP8 is the Brush Variance Palette. Here you can twist, spin, jitter, jump, hop, wave, alternate colors of your brush tips. And More. The possibilities are unlimited. Before using the Brush Variance Palette make sure you completely understand and master the Brush Options. You will need to make the Venetian Blind Brush tip to use in this tutorial. This is WAY fun Folks. Let's jump in with a step by step approach, then build a brush preset and save as a tool preset at the end. 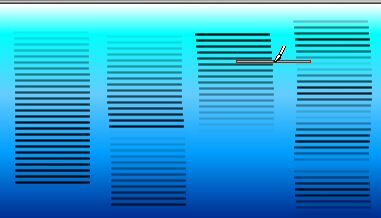 Open a new file in PSP8, any size, with a white raster background. I used 400 X 300 for the purposes of this tutorial. File > New from PSP Menu Bar. the Tool Bar on the left side of the PSP Window. Check Load Variance and Press OK.
shows in the Brush Tip Preset area. The Thumbnail, a horizontal line, shows in the Brush Tip Preset area. 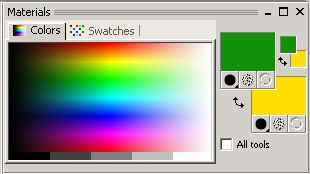 Left click in the color area of the Materials Palette to choose a foreground color. I chose a medium green. in the color palette. I picked an Orangey Yellow. the Variance settings to their defaults. on the Variance Palette to avoid from getting confused. The KISS Method. In the image, for our control, drag a vertical line an inch or so. This is the default look for the Venetian Blind. On the Brush Option Palette, change the size to 75 Hardness to 50. Drag a line to see how it looks. We will go one by one on the Variance Palette using the Mouse options only, under Setting. Note: Options in the Variance palette marked with an asterisk * apply only to users with a pressure sensitive tablet. The options available will depend on the type of tablet being used. If you have a tablet, you are on your own here. I use a mouse. We will use only the following today. Direction: The angle between consecutive mouse points on a path. Fade: In Fades the brush impression from small to large. Repeating Fade In: Repeatedly fades the brush impression from small to large. Fade Out: Fades the brush impression from large to small. Oscillating Fade: Repeatedly fades the brush impression in and out from small to large to small. At the bottom of the Color Palette, notice these features. Fade rate (pixels) Select the number of pixels over which the fade in and fade out will occur. Lower values produce a faster fade, while higher values produce a slower fade. Position Jitter (%): Select a percentage for randomly adjusting the brush impression location. Mark the Scale check box if you want the jitter to scale with the brush size. Impressions per step: Indicate how many brush impressions are made per step of the brush stroke. Drag a hammock looking shape in the image. Notice how the color changes from foreground to background as you change direction of the mouse. Change the Jitter to 45 percent. Drag another hammock shape in the image. Next change the Jitter to about 200 and drag a similar shape, See below. 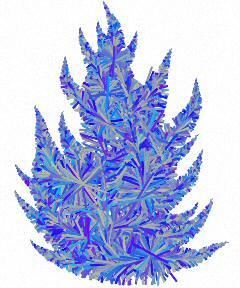 Experiment with other Jitter settings and change the colors for the background foreground. Next set the jitter back to 0, then change the Setting on Color Blend to Fade in. whatever you like. I picked blue and red. Drag a vertical line in the image. Notice the color fades in from background to foreground. Our previous fade rate was at the default of 100. Change this to 300 and drag a line. Change The Fade Rate to 50 and repeat. Notice the difference between Fade rate at 100 on the left and Fade Rate of 300 in the middle and 50 on the right. Change the Setting for Color Blend, from Fade In to Repeating Fade in. Set the Jitter to 0 and the Fade Rate on the bottom to 100. Pick new colors or use the same. I picked Ochrey yellow and blue. Change the Fade Rate to 200 and try again. Notice how the Repeating Fade in takes place over a longer distance. Actually twice the distance as in the Fade rate of 100. Next use the Fade out Setting and jitter of 0 then Fade Rate at the Bottom at 100. Next try my favorite, Oscillating Fade, from the Settings drop down Box. Set the Jitter to 0 and the Fade Rate to 50.
in then fade out endlessly. Just for grins, set the Position Jitter, under Fade Rate to 25 and drag another line. Pretty Ugly for this step. back to 0 for now. To ReCap: Color Blend blends from background to foreground color in different fashions based on the Setting chosen. Fade Rate affects the distance over which the stroke Blends the colors. Press the Reset button on the Variance Palette restoring all values to the default. Make the background color white, then press Delete key to clear the image. With Hue to Normal and 0 Jitter, dragging a line in the image paints with the foreground color only. Make the Setting = Direction, Jitter 0. Leave Fade Rate to 0. Drag a line and change the direction of your drag noticing how the notice how the hue changes as you drag. Fiddle with the settings here. Experiment and make this variance your own. Fade in and Fade out with the Hue Variance changes the direction of the color wheel when changing the hue. Eventually comes back to the foreground color. Oscillating Fade fades in and out evenly. Setting Oscillating Fade for Hue Jitter 0, Fade Rate 50, then try a Fade Rate 25. Notice the difference. 3. Saturation regulates the saturation of a color from grey to full color. Reset the the Variance Palette to default by pressing the reset button. Pick a new foreground color. I picked Purple. Pick a Saturation setting of Direction and jitter 0. Drag a line in the image. Experiment with settings of Fade In, Repeating Face in, Fade out and Oscillating Fade. Notice the differences below. 4 .Do the Lightness ones on your own. I especially like Oscillating Fade. I picked Green as foreground and White as Background. Jitter 0, Fade Rate 100. 5. Size This gets weird. Set the size setting to Direction and Jitter to 0. Fade Rate to 100. Drag a line. Is not to pretty, eh? Set the Size setting to Fade In. The size get bigger from about 0 to the size you set on the options palette. Oscillating Fade with Fade Rate set to 50. You play with the Jitter and Fade Rate settings. 6. Opacity controls how transparent the stroke is. For this create a new layer. 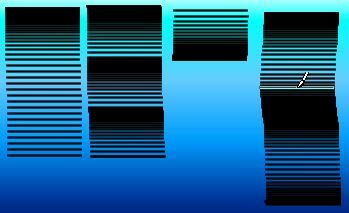 Go to Layers> New Raster Layer from the Menu Bar in PSP8. Click OK to accept the defaults. Reset the Variance Palette with the reset button. Pick Opacity setting of Direction and drag a line. I have Black as my foreground color. Notice the opacity changes as you drag. To see this more clearly, fill the background layer with a Gradient Fill. Reselect the Raster Layer, then clear it with the delete key. Change the Opacity Setting to Fade in and drag a line on the Raster layer. Pick the Setting Direction and have a go. I didn't find anything nice here, but change the setting to the Fades and drag lines. My jitter is 0, Fade Rate 50. Refill the background with white. The easy way is to set the background color to white, then select the background layer on the layer palette and press the delete Key. Delete the Raster one layer by right clicking it on the layer palette and picking Delete and Yes. Reset the Variance Palette once again and lets get to Rotation. This is one really fun setting. 8. Pick Rotation setting of Direction. Next Change the Jitter setting to 25 and drag again. Sort of looks like pick up sticks. Change the jitter to 100 and drag. On the Tool Options Palette, set the Size to 50. Try each of the Fade Settings. Set the jitter to zero and drag from right to left. Next Go back to Repeating Fade in for Rotation and change the Fade rate on the bottom in order and drag lines. Do the Same for Oscillating Fade. Go Back to Repeating Fade in, set its jitter percent to 200. At the Bottom of the Variance Palette, set the Fade rate back to 100, change Impressions per step to 3. Change the Impressions to 10 and drag a line. Reset the Variance Palette one more time and lets explore Density. Change to the Fades Settings for Density one by one with Jitter to 50. Reset the Variance Palette to default values. Thickness to 1, Rotation to 90, Opacity to 100 and Blend Mode normal on the Tool Options Palette. Pick a dark green for the foreground color and white for the background color. Drag a line. UCK !!! On the Variance Palette make the following changes dragging a line after each to see the changes. Leave the previous change intact. Color Blend = Normal, Jitter= 75. Leave Saturation, Lightness at the defaults. Rotation to Normal, Jitter to 100. Leave Density, Opacity and Thickness at default Values. At the Bottom, Set the Fade Rate to 100 and the Position Jitter to 0. Set the Impressions to 2. Drag a few curvy lines. Christmas Tree with three strokes of our brush! To finish off, let's save this as a preset for the Paint Brush Tool only. Click the Presets down arrow on the Tool Options Palette. On the Preset Save box, enter a name such as Christmas Branch for the preset, and any other information you want. blue and yellow gives different results.